Zion Rock and Mountain Guides is filled with awe and admiration for the beauty and inspiring landscape of Zion National Park. Everyone involved with the company is here because they enjoy the location and the beauty of the park. Zion ROck and Mountain Guides wants to make the adventures and the beauty of the park available to all. As the park is so vast and complex and visitors have a limited time at the park, Zion ROck and Mountain GUides provides a source to direct visitors to breathtaking views and activities that they would not be able to locate and experience on their own. It would take years for a person to find the match for the exact adventure that they are looking for. 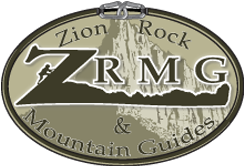 Zion Rock and Mountain Guides provides experienced guides who are familiar with the park and have been trained in climbing, canyoneering, mountain biking, yoga and history of the park. We provide all adventures that the millions of visitors of the the park are looking for. We realize that your time in the park may be limited. We are here to help you.